JotForm supports a handful of Payment Processors that would allow you to collect payments through your forms. You can sell products, get a user defined amount, collect donations or sell subscriptions. When dealing with subscriptions, you may need a way to charge your customers a one-time payment instead of a recurring one. And this will be the focus of this article - To setup your form with a one-time payment subscription. We will not cover all the payment gateways since the workflow and setup are relatively the same. 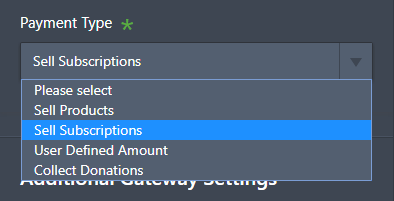 What stays constant would be the PAYMENT TYPE - It should be set to SELL SUBSCRIPTIONS. Below are a few examples on some of the most popular payment processors, and how you can setup a subscription with a one-time payment. It's really straight-forward, just set your Subscription's NUMBER OF PAYMENTS option to 1. This means your users will only be charged once. 1. 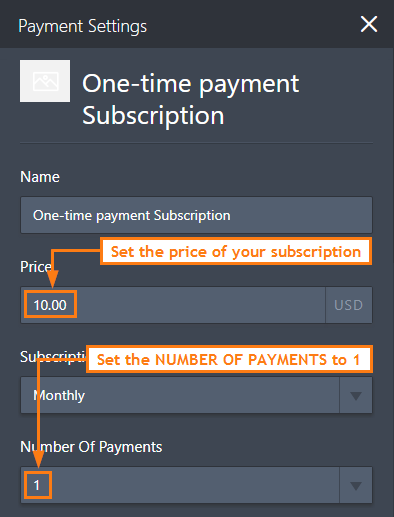 Set the base PRICE of your Subscription to 0. 2. Enable the SET CUSTOM FIRST PAYMENT COST. 3. Then, set the FIRST PAYMENT price to your desired one-time charge. So, what happens with this setup? It would charge your users based on the CUSTOM FIRST PAYMENT COST and will never be charged again (since the PRICE is set to 0). And knowing that it's a first payment cost, they will only be charged once. For Square users, their API doesn't support subscriptions yet. While Braintree users need to setup the number of billing cycles within Braintree. I want to add a paypal button to one of my surveys forms for TOC Schools. How do I do that?